On November 8, 1895, Wilhelm Conrad Röntgen, a German physicist, produced and detected electromagnetic radiations and named them X-Ray (X standing for unknown). By accident, he discovered the possibility of using electromagnetic radiation to create images. This important discovery made it possible to see the inner structure of the body without cutting into the flesh. This achievement earned Röntgen the first Nobel Prize in Physics in 1901. Today X-Rays are a valuable tool used in medicine as a diagnostic device. Since 1979 the American Society of Radiologic Technologists has sponsored National Radiology Technology Week to promote the important role that medical imaging and radiation therapy professionals play in providing excellent and efficient health care. 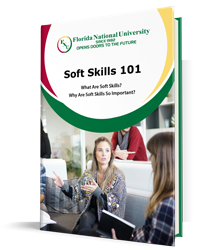 Florida National University joins the initiative of the American Society of Radiologic Technologists and salutes all active and retired medical imaging and radiation therapy professionals. Also, we thankfully appreciate their assistance to our students in completing the training process providing them with support and guidance during their clinical rotations. 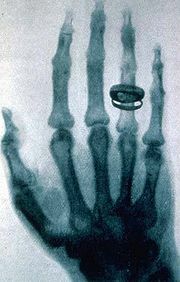 X-Ray of Röntgen’s wife’s hand, her wedding ring is perfectly displayed.